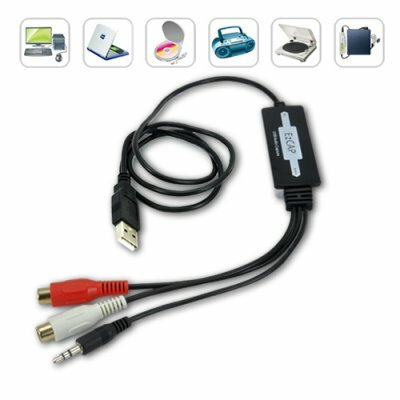 Successfully Added USB Audio Capture Device For PC and Mac to your Shopping Cart. Capture audio directly to your PC or Mac computer with this USB audio capture device. The K68 USB audio capture device lets you use your existing turntable, cassette deck, CD player and more, to capture high quality audio to your PC or Mac computer! This is the most simple and affordable way to get your analog music into the digital realm. With the K68 USB audio capture device and the included editing software you can edit your audio exactly the way you want it. What does this mean? Well, has there ever been a part of the music track that didn’t sound right, maybe the original recording was too loud, maybe there’s a section of audio you wish to shorten or remove, or maybe there is not enough bass on the original tape recording? If so, you will be happy to know that with the included software you can remaster your old recordings by adjusting the audio settings and make your tapes and records sound new again! The possibilities are really endless with this amazing device. Connect virtually any piece of audio gear to your PC or Mac computer, remaster your old analog tapes, edit songs and create new music, enhance the audio quality of old songs, or remove static, hiss, hum, or other constant background noises. With the K68 you can do all this and much more, and without the need of spending a fortune on studio time to do so. Order the K68 now while this amazing product is still in stock and ready for immediate shipping. From the leaders in wholesale electronics, Chinavasion. Use the USB ports on the back of the computer if the front ports do not capture the audio correctly. This product saves audio to your hard disk drive (HDD). Therefore the size and quantity of media you save is limited only by the size of your hard drive. Enjoy! Is there any plug-in support for the software? There sure is! Just go to audacity.sourceforge.net/download/plugins to download all the latest plug-in, enjoy!